Kettlebell Goblet Squat is a variation of the regular front squat which primarily builds the quadriceps, glutes and hamstring muscles. The front loaded position with the kettlebell will require you to tighten your core muscles by contracting your abdominal muscles. This will stabilise your lower back and maintain a slightly angled position throughout the movement. Kettlebell Goblet Squat will build the quadriceps, strengthen and develop better hip flexibility, mobility and stability. This is important for sports such as surfing, skiing, skateboarding, tennis, basketball, golf and windsurfing. Bring up a kettlebell to your upper chest. Grasp the ball of the kettlebell with both hands; the handle must be upside down. Assume a shoulder width stance, feet angled out slightly. Tighten your core muscles, chest out and maintain a small arch in your lower back. Inhale then initiate the squat by bending at the hips and flexing the knees. Maintain the descent until the crease of your hips is lower than your knees. Exhale then squat up by pushing your feet through the floor, extending the knees and the hips until you are back at the top position. 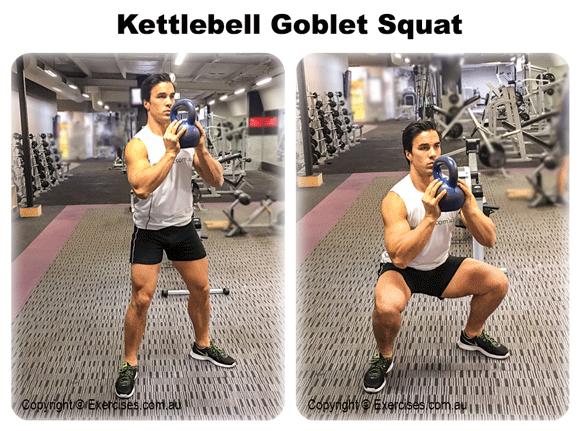 Repeat the movement until you have hit the targeted number of reps.
Kettlebell Goblet Squat is a great exercise to build muscle, improve balance and coordination. It will also improve flexibility. However, if flexibility is an issue you may maintain the descent until the tops of your thighs are parallel to the floor. A deeper Kettlebell Goblet Squat will result in better leg development because the adductors will be involved in the movement. Always keep your elbows high to maintain better balance. It is important to grip the ball of the kettlebell with the handles upside down to maintain a more upright position. If the handle is upright, the tendency will be to drop the elbows. When your elbows are lower, it will place your upper body in a more angled, forward position. At the bottom position, make sure your knees do not go over your toes.